More interesting backstory, and this goes all the way back to when Fargo was in charge! It’s interesting to see, and I’m warming to the old Judge too! Meanwhile, Dredd & Joyce are chasing down some assassins who have killed their witness. I do enjoy seeing these two team up! The ending, and the beginning of Skip Tracer link up nicely! Skip is investigating and it seems to have some links to the war – which Skip was part of. We’ve got military spec weapons, a very good sniper and a mystery that seems to be getting deeper. It’s well told and the action looks like it’s going into a higher gear next issue! The threat emerges, and I think we get to see what this is all about. The convention setting is excellent, and I love the snarky commentary! 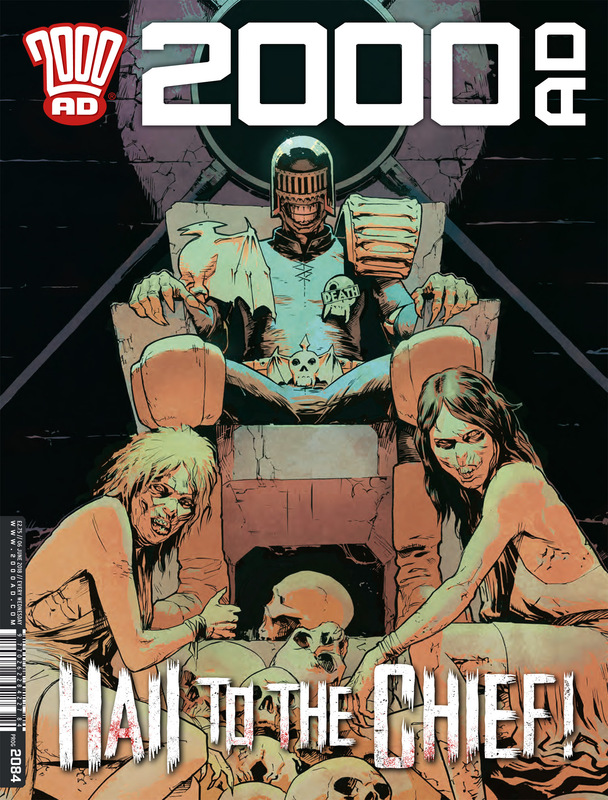 This issue goes to the dark side – with some of the issues facing the Dark Judges. The sisters seem to have their own plans, and they are conflicting with Judge Death’s! Meanwhile there are other schemes afoot with Judge Psiren (who seems to be having trouble) but she has a new Psi Aide who may help, or make things worse. An interesting break! Red looks up an old friend, and although things don’t go all her way, it does look like she’s got a lead. There’s some interesting commentary on her nature here, and I wonder if this will be something as we move on? There’s a little bit of action – not much, but some interesting mutant parts. It’s a slow build so far, but I’m sure it will pick up!